There are plenty of options when naming a German Shepherd puppy. Because the breed is known as being a loyal protector, it has become one of the most popular. That means there are plenty of other owners out there from which to grab name ideas. 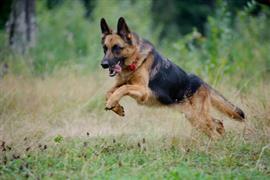 Many owners choose a name that portrays the protective nature of their German Shepherd. Names related to home security, defense systems, or anything that pertains to shielding and safeguarding all become potential sources. Other people favor German names that fit the origins of their puppy. Hans, Katja, and Klaus are a few examples. Names can also come from the breed's distinct appearance. While their coats vary greatly, most contain the same general color scheme of black and either tan or red. With a common and distinct appearance and a heavy presence both working and in backyards, German Shepherd names are easily found around the neighborhood and across the web. Some of our pages will contain a subcategory. A subcategory is a slightly more specific grouping than the main topic of the page. For a subcategory, we will include a separated table of names and corresponding descriptions. An example of a subcategory of Red Dog Names would be 'Dog Names Inspired by Red Wines'. If you have any subcategory ideas for the German Shepherd Names page, we would love to hear them. Use the form below to submit your ideas.